...I'm trying to get the UM2 working with dual head. Now it is working almost good, one of the biggest problems is slicing software with good functions like prime pillar and ooze shield. Simplify 3D works, but has also some issues with dual extrusion. In Cura I can't find any support for dual extrusion!? This are the pictures of the first flights of our Corsair AU-1. After we had finished the model plane in early spring, we found that center of gravity was way to far back. We decided to move engine 40mm forward make a redesign of the cowl and saved 600 grams lead in the front. It is flying very good now and we are so happy. The shape of the cowl is not perfect, because of that I want to print a second one with slightly different shape. 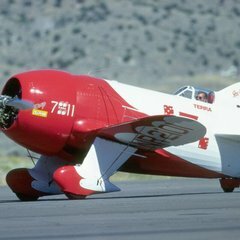 The plane has a 60cc four stroke Radial engine. Its wingspan is 215cm, it's weight is 12.5kg.